This Sunday's gospel doesn't need too much explanations. 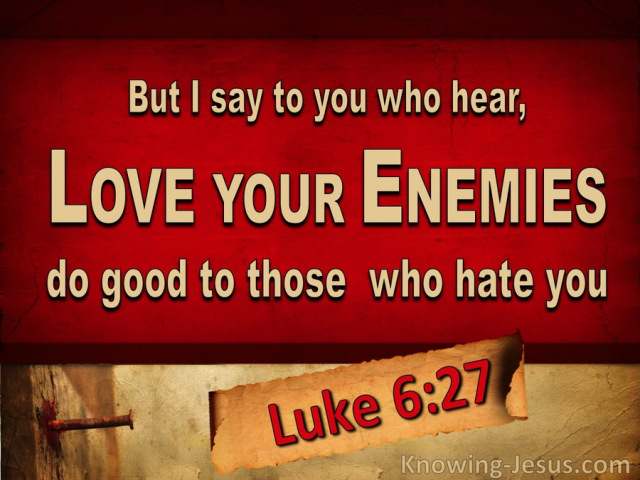 It is what it says, "Love your enemies, do good to those who hate you, bless those who curse you, pray for those who treat you badly." There's no logic to this. Only the logical person would say, "An eye for an eye; a tooth for a tooth." 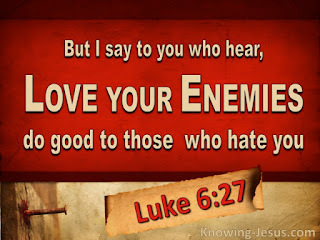 But Jesus would command us, "Love your enemies." Why is this the logic of God? For one, when we retaliate against our enemies, how do we differ from them? "'Vengeance is mine,' says the Lord" (Deut. 32: 35). But it is the Lord who speaks, not us. We are not gods. Besides, Jesus reminds us of the golden rule, "Do no do unto others what we don't want others to do to us." Remember, the wounds we inflict upon our enemies come back to us with vengeance. "Love one another" is Jesus' command to us; and that means everyone, saints and sinners, friends and enemies alike. "For he (the Most High) himself is kind to the ungrateful and the wicked." 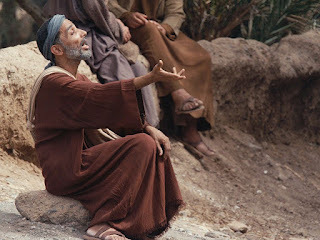 Furthermore, learn to see the face of God even in the enemy, for Jesus reminds us, "Whatever you do to the least of my brothers and sisters, you do it to me" (Mat. 25, 40). Lastly, if ever we feel not forgiving our enemies, look at the man on the cross who suffered even for his enemies. He said, "Father, forgive them; for they don't know what they do" (Lk. 23, 34). Jesus forgave his enemies a long time ago. Who knows? Our enemies might be the first ones to go to heaven ahead of us. So, let us be concerned with the salvation of our enemies rather than with their doom. The logic of God is love; and it is all that matters. I would like to see "blessings" in the first reading to reflect Mary as "Mother of God". This also gives inspiration to us to face the New Year with joy and hope. Let's be inspired by the word "blessings"as we face the New Year. 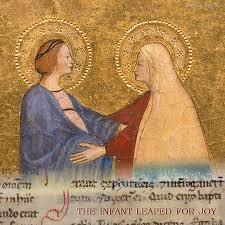 Mary too is "blessed among women" for being the Mother of God. Let's reflect on the benediction prayer in the first reading as inspiration to enter the New Year as also to venerate Mary, mother of God. The first in the Book of Numbers is the sentence "May the Lord bless you and keep you." Blessings have various meanings. It may mean "barak" meaning "to kneel" before God in total adoration to Him who provides for all our needs. 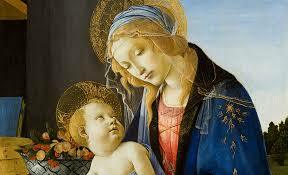 Mary's "Magnificat"reflects her total dedication to God as her spirit rejoices in God her Saviour. The second phrase is "May he let his face shine upon you." Mary is totally immersed in the mystery before her, the loving Son who whether sleeping or awake, looks back at her with tender, loving eyes. A second meaning of blessing is "esher" or "happiness". One cannot fathom the feeling of the beatific vision. But this cannot be possible if we don't make efforts to strengthen our faith in God enough to see his divine face shining upon us to guide us each moment of our lives. The third phrase is "May he lift his countenance upon you and give you peace." Usually, when God lifts is face, he passes judgement of life or death. But with this assuring presence, he brings peace. Peace is a process of becoming, a state of total health and well-being. Peace can only be attained if we work for social justice and social change. 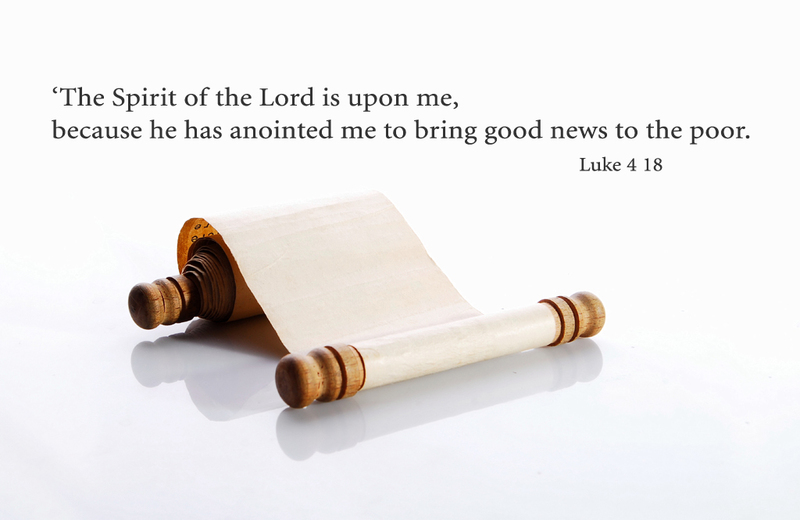 Working for justice is an integral component in the preaching of the Good News. The third aspect of blessing is "eulogeo" or a kindness. Mary lived a life of kindness, service, and compassion, and today, she never fails to pray for us still. Facing the New Year filled with blessings is our elusive dream. Only a year dedicated to God is a blessed year. Once upon a time there was a man in the Serengeti District of western Tanzania called Marwa. In the sixth grade he studied the Christian religion. At Baptism he chose the name Emmanuel which means "God is with us." After finishing high school Emmanuel read magazines and books about God. He believed that God is truly present among us, but he asked: "What language does God speak?" Emmanuel posed his special question to different church leaders in his village. 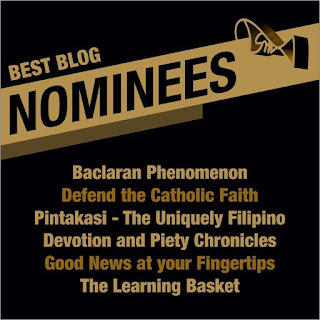 The old catechist answered. "I think that God speaks Latin." The chairperson of the parish council guessed, "God speaks our local language Ngoreme." But the searching youth Emmanuel had doubts. "When I get the right answer," he said to himself, "I’ll know immediately and feel great joy." So the young African set off on a journey. In the neighboring parish he asked again: "What language does God speak?" One Christian suggested Kuria, another local language. Again Emmanuel had doubts. He began to travel across the whole of Tanzania visiting small towns and big cities. In one place the Christians were certain that God spoke Swahili. People in western Tanzania said Sukuma while residents in the northeast said Chagga. Emmanuel was not satisfied with these answers. Remembering the African saying -- "traveling is learning" -- he journeyed outside Tanzania. The Kenyans said Kikuyu and the people of Uganda answered, "God speaks Ganda." In West Africa he got different replies: Lingala in the Democratic Republic of the Congo (DRC), Hausa in Nigeria and Arabic in Morocco. He decided to travel the whole world if necessary. Passing through Europe he was told "French, German and Italian." The Christians of North America said "English" while South Americans replied, "Spanish." In his heart the young Tanzanian knew that these answers were inadequate. Determined to find the real truth he went to China where the local people insisted that God speaks Mandarin or Cantonese. Emmanuel was tired from his long travels but he resolutely pushed on. In India he was told Hindi. He reached Israel late in December. The local inhabitants said, "Surely God speaks Hebrew." Exhausted by his long travels and the unsatisfactory answers, Emmanuel entered the town of Bethlehem. The local hotels were filled. He looked everywhere for a place to stay. Nothing was available. In the early morning hours he came to a cave where cows and sheep were sheltered. He was surprised to see a young woman with her newborn baby. This young mother said to the traveling youth, "Welcome, Emmanuel, you are very welcome." 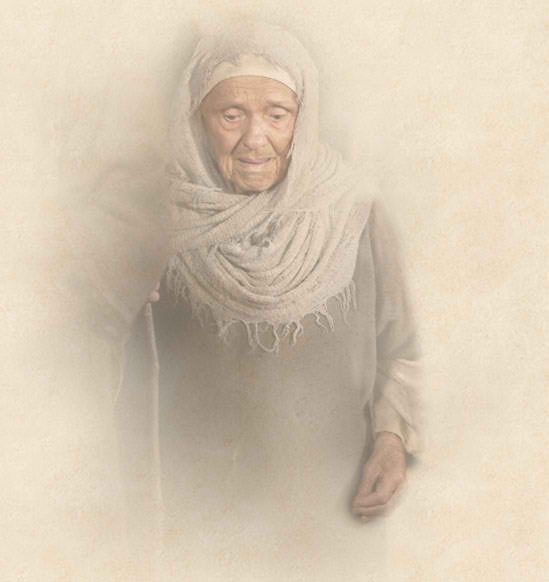 Astonished to hear his name, the young African listened in awe as the woman called Mary continued: "For a very long time you have traveled around the world to find out what language God speaks. Your long journey is over. God speaks the language of love. God loved the world so much that he gave his only son so that everyone who believes in him may not perish but may have eternal life." Overjoyed to hear these words of Mary the young Tanzanian understood Gods language of love for all people, for all races, for all nations. Emmanuel exclaimed, "Truly, today God is with us."" This parable reminds of how powerful this language is more than all other languages. It is not like the language we've used in as we communicate to others everyday. How do we use the language of love in the sinful areas of our lives? I shall use the images coming from the gospel. First, no room at the inn. "Sorry, there's no more room left." The first act of violence done to our Lord is closing the doors for him to work in us. But how did the Holy Family tackle this? Not through hatred, but through a quiet understanding and acceptance of man's wounded humanity. This is a language of love. Second, Mary wrapped Jesus in swaddling clothes and placed him in a manger. These are signs of abject poverty. While we wallow in material things, our dedication to help our brothers and sisters remains wanting. 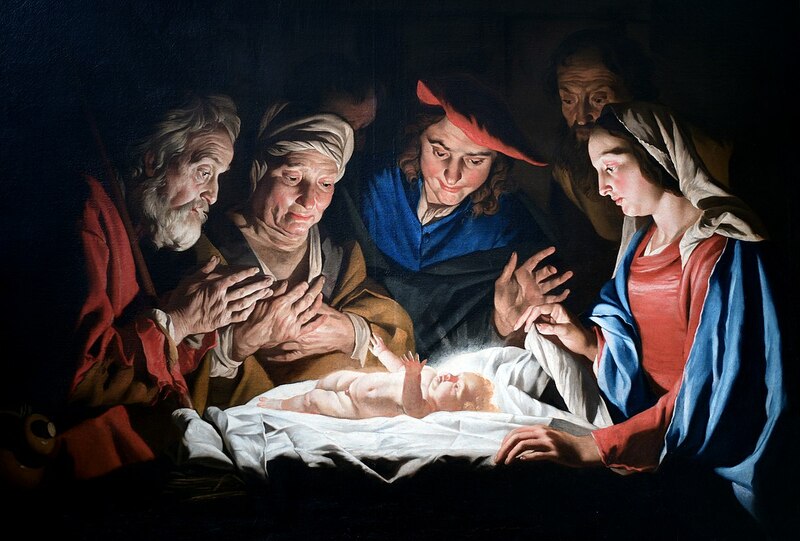 We keep them wearing swaddling clothes. How did Jesus tackle this? Jesus identified himself with them so we may remember Jesus in our suffering brothers and sisters. This is love. Third, the night. The night represents the darkness of sin and hopelessness. How did heaven tackle this? 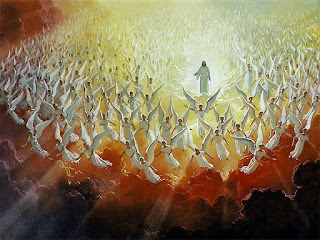 Angels lit up the night sky and sang "Glory to God in the highest". The night cannot dispel the light. That light is the hope in our hearts that no matter how violent, how poor, and how rejecting situations are, nothing can stand in the way of the Lord to help and save us. We should light up our lives for others. Then our Christmas would be complete! The readings are in exultation of what is small. I'm immediately reminded of the spirituality of St. Therese of the Child Jesus, "The Little Way". It calls for the sanctification of life using the ordinary and everyday things. We don't need to look for the greatest acts that will lead us to heaven. Heaven is right here in the midst if we care to see the profound. Surely God is in the most ordinary things. The first ordinary being is us. No matter what exultation we do to ourselves, we cannot deny our littleness before the whole world, before others, and most especially, before God. But nevertheless, we are loved by the Lord with such profundity. In Psalm 8, it says, "What is mankind that you are mindful of them, human beings that you care for them?" We must be so loved by the Lord more than we love ourselves. The second ordinary being is the Blessed Virgin Mary. In the Magnificat, she sang, "for he has been mindful of the humble state of his servant. From now on all generations shall call me blessed." Even now, she never fails to lead us to God the moment we think of her. And last but certainly not the least, our Lord Jesus, our birthday celebrant, the tiny child who was born of poor parents in a lowly stable and be visited by the poor shepherds. We can only look at the Blessed Image with such devotion and constantly remind ourselves that it is not in being proud that we are saved, but by the humility of Jesus. 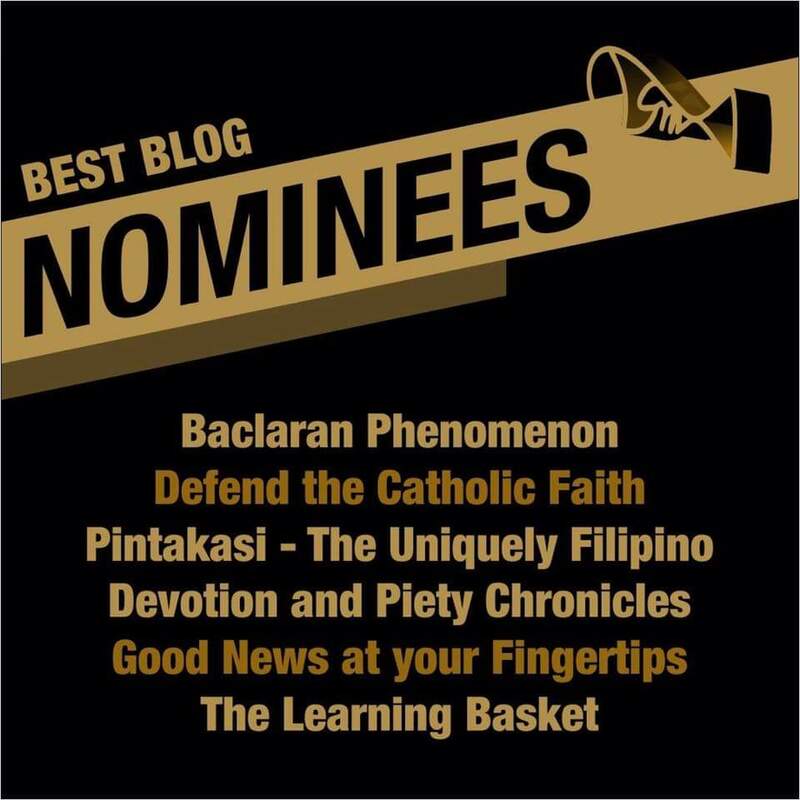 May these inspire us to take the humblest path to sanctification. The Son is coming as a king, "On him was conferred sovereignty, glory and kingship." The second Reading tells more of this King, "It is he who is coming on the clouds; everyone will see him, even those who pierced him, and all the races of the earth will mourn over him. This is the truth. Amen. ‘I am the Alpha and the Omega’ says the Lord God, who is, who was, and who is to come, the Almighty." In the gospel, Jesus admits he's a king. But his kingship is far from that of earthly kings. Our task is to demythify the concept of kingship. 1. The language of earthly kings is that of power, money, and influence. Jesus' language is that of service, poverty, and humility. 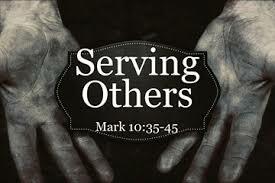 Let us aim to serve rather than be served as Jesus did. 2. Jesus gives witness to truth. His kingship is marked by truth. In our times today, there's an increasing incidence of trolls utilizing fake news to advance propaganda of political leaders. This is far from the truth. But the truth sets us free. And the only truth is that Jesus is king and we are his servants. 3. Jesus is the Alpha and Omega. His kingship belongs to the first beginning and the last end. Earthly rulers are temporal. Rely solely of God. Secondly, our lives are also temporal. But we shall be held accountable after our lives here on earth. Strive to dedicate each moment serving the Lord. The consequence is eternal. God is clear on what he wants us to do: love him above all things. This is also reechoed by Jesus in the gospel, thus, affirming the very heart of the faith. It is true that Jewish religion enunciated the ultimate laws. But the spirit of the law could only be interpreted through the eyes of God's beloved Son - Jesus Christ. First, to love God above all things - demands utmost total and unconditional obedience, adoration, and offering of one's life to the Father, the source of all life. Who could ever have authority over life itself? 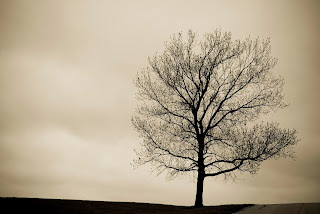 Isn't it God alone? Who could ever hold the key to true life and order? Isn't it God alone? Do we want an organized life? Then follow God! Second, to love one's neighbor as oneself - to love others means to recognize the other has the same dignity as I have for being a child of God. Thus, to accord justice, respect, as well as honor in the same way as I treat myself becomes an absolute norm, considering that I and my brothers / sisters are created in the image and likeness of God. 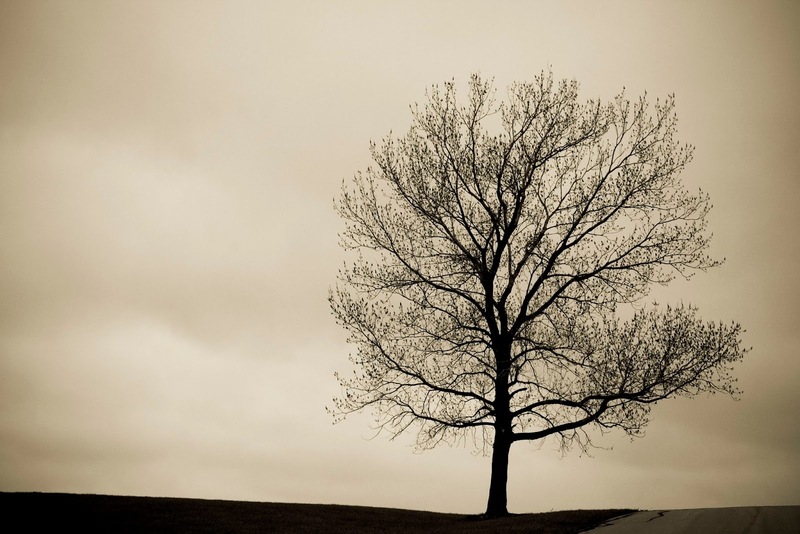 The second norm is a call to build ourselves as one family of God. Third, these two laws point to Jesus who fulfilled God's commands and brought it to fulfillment. He is God's perfect priest who offered the perfect sacrifice, himself all for our sake. Now he says to us, "Love one another as I have loved you." This law manifests perfect communion with God and with one another and eradicates all tinge of separation, selfishness, and animosity. This law reflects the true picture of heaven. 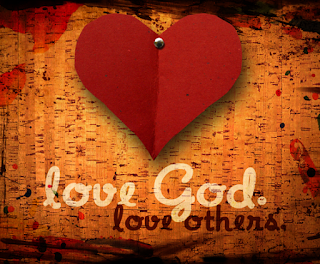 If we live out this law of love, God resides in us and we in God; we also reside in the hearts of one another. We celebrate the Communion of Saints every first of November. "All Saints' Day was formally started by Pope Boniface IV, who consecrated the Pantheon at Rome to the Virgin Mary and all the Martyrs on May 13 in 609 AD. 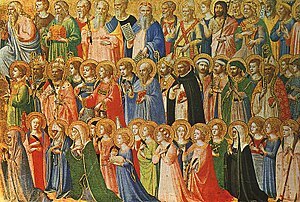 Boniface IV also established All Souls' Day, which follows All Saints" ("All Saints Day", Catholic Org, last accessed Nov. 1, 2018). It is meant for us to remember all unknown saints, yet in perfect bliss with the Lord, who are now in heaven. November 2, we would offer the mass for our suffering departed in purgatory. 1. It is meant for us to incorporate ourselves in the communion of saints right this time of our lives and not just consider sainthood in the afterlife. Our lives today reflect our willingness to be counted among the saints. 2.1. Communion in faith (CCC 950) - let us nourish this faith and also ensure that others deepen in their faith. 2.3. Communion of charisms (CCC 952) - These are gifts coming from the Holy Spirit meant to enrich every Christian community. Let's offer to use this gifts for God and others. 2.4. Communion in charity - (CCC 954) - In the Acts of the Apostles, it's clear after the Christians shared their resources with one another, nobody is found wanting (Acts 4:34). Love abounds. Jeremiah prophesied that God would once again gather his people as was Moses' time. 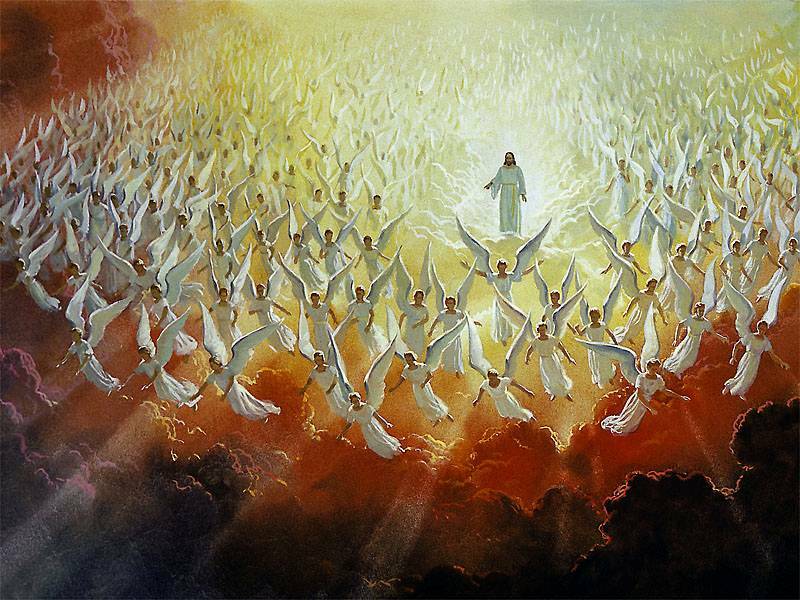 This would be a joyous event, and the scattered children of God would come home with tears in their eyes; and the Lord would once more take care of them. A "people called by God" is what we presently call "The Church". The challenge is: are we teary-eyed when we gather together as a Church? Perhaps, we know so little about being church; perhaps we were somehow "blinded" by what we were accustomed to define it; that's why the way we live Church is far from the Heaven that we envision. The gospel is about healing the blind Bartimaeus. The gospel is about Jesus healing the physically blind. What we dare to ask is to heal our spiritual blindness brought about by skewed images of the Church and our faith. We cannot proceed to the next level of seeing unless we admit that we need conversion. Yes, we need conversion throughout our lives. We need to change outlook of life that conforms with God's will, not ours. Unless we seek conversion, we would not be able to see through the eyes of our faith. "Lord, I want to see." Let's go a step further and say, "Lord, I want to see you everyday." I want to see you in my work or studies, in my family and community. I want to see you in the daily events of life. We may go a step further and pray, "Lord, grant that I may see things as you see them." Only then could we see God's presence in the world. The final element of seeing through the eyes of faith is to commit oneself only to the truth. We know that the truth shall set us free. We shall not compromise truth with lies or self-effacement. "It's God whom we shall follow rather than man," according to St. Peter and John when threatened by the Jews in speaking about Jesus. When we are committed to what is true, we shall bring all others to the Lord, thus, making our experience of Church really genuine. "Kung may tiyaga, may nilaga"; "Kung anong tinanim, siyang aanihin." These words remind us to persevere if we are to attain our goals in life. Perseverance calls to be patient even in sufferings if we are fully convinced that all our efforts will pay off. But perseverance is also the mark of a true servant, who perseveres to do all tasks assigned to him. The servant is the mark of a true Christian. If we claim we are baptised Catholics, it is imperative that we serve as Jesus served, by offering his life on the cross. How then can we be good servants? Let us know who we are and what our place is in this world. God is the Creator, we are the created; God is heavenly, while we are made of dust. God is Lord, and who are we? Servants. What is the end of a servant's being? We easily forget when our end is to live comfortably and to grow rich and powerful. Is that it? We might aim to be rich, but this is not a ticket to enter heaven or eternal life. If our end is in God, then let us serve him now! What makes us persevere in this task? Love. Love makes us endure all hardships; for love of God and neighbor. If there is no love we won't last. Do we claim that we love God now? It shows in our actions and in our commitment to offer time, talent, and treasure for love of him and one another. What makes us persevere in this task? Love. Could we now admit that we are servants? That's the only way a Christian is to go. "Jesus looked steadily at him and loved him, and he said, ‘There is one thing you lack. 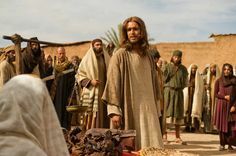 Go and sell everything you own and give the money to the poor, and you will have treasure in heaven; then come, follow me.’ But his face fell at these words and he went away sad, for he was a man of great wealth." We may not also understand Jesus' words, thus, losing the opportunity to serve him when he calls us. I entreated, and the spirit of Wisdom came to me." We need wisdom to discern what God wants, not what we want. Wisdom is the mind and heart of God himself, revealing his plans for the world and the contents of his heart. Our minds and hearts, because of sin, are alienated from God. But with the gift of the Holy Spirit, we can still find our way back to God. "Go and sell everything you own ..." calls us to develop a spirit of detachment to material things. They are simply what they are, instruments to an end. The end is important in discerning wisdom. Is it God who is our final end? Then why are we so preoccupied with material concerns that we don't have time to serve the Church and others? "Give the money to the poor ..." Another component of wisdom is thinking about others instead of self. The self is the third priority of our lives. God is first, others are second, we are third. If we all make ourselves first, we won't have have the compassion for others. And if a whole community would be composed of selfish people, imagine the devastation to that community! But is the community is composed of sharing people, imagine the life that flows in the community! Only in following Jesus could we experience the fullness of life! "Come, follow me..." Actually, this SHOULD be the theme of our lives! Following him does not come only as we nearing death. Following should happen while at the peak of our lives! Only then could we experience the real joy of following him each day and the excitement each day brings. But this is the message: only in following him till the end can lead us to the fullness of life! Today, Joshua called on the people to renew their covenant with God. In full freedom the Israelites responded. In today's gospel, after the long discourse on the Eucharist, still the people left Jesus, claiming that it's hard to swallow this teaching. Jesus turned to his apostles and asked, "Are you also going to leave me?" The apostles responded, "To whom shall we go? You have the words of everlasting life?" They also believed that Jesus is the Holy One of God. The closest covenant with Jesus is the covenant between husband and wife, when the two shall be one body. This connotes full freedom of two partners to enter into a contract. Even though God knows what will happen to us if we desert him, still he respects our full freedom to enter into his covenant. The Eucharist is our covenant with Jesus: "This cup that is poured out for you is the new covenant in my blood" (Luke 22:20). First, Jesus' responsibility to care for us - Jesus' action on the cross to forgive us and give us life. Second, love that binds - A new covenant is created: "I will put my law within them, and I will write it on their hearts; and I will be their God, and they shall be my people" (Jeremiah 31: 31–33). This is bound by a deep relationship with God and with one another based on love. Third, our share in the covenant - to know, love, adore, and serve God is the deepest commitment we can ever give to God. This should be manifested in our new way of life: the way of love. Communion - what a wonderful word that signifies not just a special kind of unity, but of an intense reality of oneness that cannot be separated by any time and space! First, union with Christ - The Eucharist is the foretaste of heaven because here on earth, union with Christ is made possible. We further expand this thought by incorporating our thought, word, and deed to that of Christ, making us one body in him. It is becomes possible for us as recipients of the Holy Communion to be one with each other as one body of Christ. Second, union with the holy things - communion of saints, the bread of angels, bread from heaven, medicine of immortality. Such union is totally possible only if we allow ourselves to be united with the Church, which from it is born the saints, the sacraments, and all graces that come out of it. Third, viaticum - the last food of our journey to everlasting life which is none other than Jesus himself who will embrace us and lead us to his kingdom. Desire for total union as you receive the Holy Communion, union with God and with one another in the bond of pure love. This is the second part of Jesus' discourse on the Eucharist. It is prefigured in the first reading when an angel commanded Elijah to eat the scone and drink the water. These sustained his journey for forty days and nights without food till he reached Horeb. In the gospel, Jesus said, "I am the living bread which has come down from heaven. Anyone who eats this bread will live for ever." I would like to dwell then on life the Eucharist is giving us, both in this world and in eternal life. But a condition for that life is to acknowledge that Jesus is present in the Eucharist. Presence. In today's times, this presence is replaced with virtual reality. A person who is not present can still be present virtually by liking and making entries on social media. But presence is still different. It's the person in front of you body and spirit, ready to assist you or lend a hand. Jesus is totally present to us. 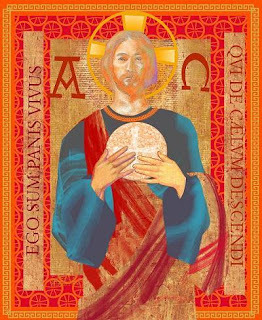 The Jesus who said, "Take and eat; this is my body" is the same Jesus present in the priest as he raises the bread and says, "Take and eat, this is my body. Second, Jesus is present as we receive him in Holy Communion. We receive him by the mouth; we savor his presence. We walk with utmost reverence to Jesus inside our bodies. 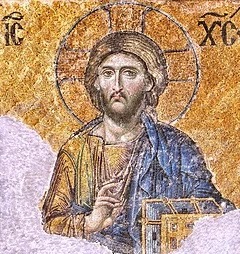 We become incorporated to Jesus' own body, making him our own. Third, we become Jesus' presence to others. We use every inch of our bodies to reach out to people, to forgive, to extend help to the poor, to raise up the fallen. We give life to others because Jesus is present to us. Grant that we may be present totally to Jesus every time we participate in the Most Blessed Eucharist. 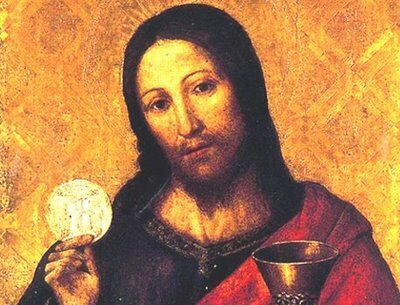 What is the Eucharist for us personally? From its original word, it means "thanksgiving to God". for through your goodness we have received...the bread and wine, fruits of the earth and work of human hands..." That is thanksgiving. We have our whole lives to thank for. The air we breathe, the people we meet, our homes, the food, our strength... God supplies everything for us. Sometimes, our words of thanks come in late. We need to be given before we can thank God. But God already supplies us even before we can ask for the grace. Thank God also for the things money can't buy. Love or compassion, sharing and caring, forgiveness, integrity. These are all faces of goodness. Most of all, thank Jesus in the Blessed Eucharist. He's the only one who can give us life. I thank the Lord for the gift of priesthood. Every priest may be weak, but he is endowed with the gift to celebrate the Eucharist and to transbustantiate bread and wine into the body and blood of Christ to be shared to others. Only Christ can save us, forgive us, and bring us to life. Only Christ can supply us with the gifts of compassion and love. Only Christ can orient us to a life of stewardship. 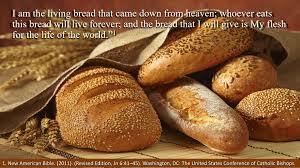 Christ is the bread of life. I am fond of stories; every story starting with a beginning, with a middle and an end. The story of Ezekiel tells the word of the Lord as being planted on a high mountain, then he takes care of it until it becomes a noble cedar where animals would rest in its shade. It is the Lord who did it. 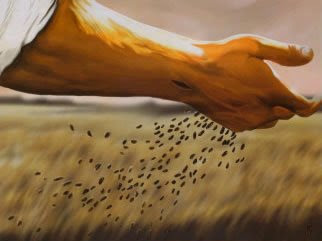 The parables of the kingdom of God say one thing - it is God who planted the seeds, make them grow, till birds can rest in its shades. We are witnesses of the story that is unfolding - the story of the kingdom of God in every heart. We are not the planters nor the keepers of the kingdom. We witness various things how God works. How his word is planted daily in people's hearts. He plants every seed each day at each moment. Are we still listening? Are will still accepting the the good news? How he nourish his word every heart. Are we giving time to nourish the word through the various opportunities the Church is hosting? Do we give it to the slow but sure development of a spirituality marked by faithfulness to God? How his word bears fruits in every heart. Do we see concrete manifestations of the word in every person, in their thought, word, and deed? Do we sense a building of a community of disciples faithful to the word?